Go to the main page of our website. Click on the employment tab and it will guide you through the process. main page of our website. 1. What do I need to get a spay/neuter voucher? 1. How many Animal Services Officers are there? The Animal Services division has 5 field officers, with one of these officers being scheduled to work from 5 PM until 8 AM to respond to after hours emergency calls. 2. When is a dog considered to be at large? A dog is considered at large, or loose, when it is outside of a secure enclosure. That enclosure is usually a back yard, as long as a fence or dog run can keep the dog from getting out. A dog is considered to be at large even if it is in your front yard, if that yard does not have a secure enclosure which can prevent the dog from escaping. 3. What can be done about stray cats that are on my property? Homeowners are allowed to put traps on their property. A cat trap may be picked up at the Midland Animal Shelter. A $75 deposit is required and the trap must be returned Friday. Cat traps can also be purchased at local hardware and feed stores. Animal Services will remove animals from our own traps as well as those that are privately owned. 1. What is a spay/neuter voucher and how can I get one? A spay/neuter voucher is available to any City of Midland resident, is worth $70 toward toward the cost of a spay/neuter procedure, and can be used at any veterinary clinic or hospital in Midland County. You may pick up a voucher during our normal shelter hours and you will need to have the following items with you at the time the voucher is issued. 1. Your pet wearing a current city license. 2. A copy of the rabies vaccination certificate, issued by your veterinarian. 3. Proof that you live in the city limits of Midland. A drivers license is not acceptable. 2. Where is the shelter located and what are the hours of operation? The shelter is located at 1200 N Fairgrounds Rd, next to Reyes Mashburn Park. The shelter is open to the public from 9:30 - 5:30 M - Th, and 9:30 - 4:30 on Fridays. 3. Does the shelter have a veterinarian on staff to administer rabies vaccinations to animals? No, but a licensed veterinarian does come to the shelter on a daily basis and gives a rabies vaccination to any dog or cat that is adopted, reclaimed, or transferred and does not have proof of being currently vaccinated. The rabies vaccination is required by Texas Health and Safety Code 826. 1. Do you need a permit for a storage building? Yes. Any size of storage building will need a permit. 2. Is it against City Code to have vehicles parked on the lawn? Yes, vehicles should not be parked on an unpaved surface. 3. What steps do I need to take to have a vehicle removed from my property? As the property owner, you may sign a Property Owner’s Consent to Remove a Motor Vehicle. 4. How can I request additional watering hours or days? A Variance Petition Form is required and can be obtained in the Code Administration Office on the 4th floor, suite 430, at City Hall (300 N. Loraine) or via our interactive online form. 5. Does the City of Midland Code Compliance Division remove graffiti? Yes, Code Compliance will remove graffiti (at no cost to the property owner) with the submission of a Graffiti Abatement and Indemnity Agreement. The form can be obtained at the Code Compliance Office on the 4th floor, suite 430, at City Hall (300 N. Loraine); or by contacting 432-685-7410. 6. What type of vehicles are considered to be inoperable and in violation by City Code? A vehicle is considered inoperable if it does not display current registration and inspection stickers, has flat tires and/or is wrecked or damaged (must be street legal). 7. Who is responsible for the upkeep of the alley? 8. Can you park an RV in the back yard and stay in it? No, RVs may not be used as living quarters. 9. Can a business operate in a residential district? Yes, Customary Home Occupation is allowed with certain restrictions. Code Compliance can answer these questions. 10. What is considered a junk vehicle? All vehicles visible from a public right-of-way must be currently registered and inspected, not be wrecked or have flat tires. 11. Can I put a tarp or car cover over my vehicles? 12. How many garage/yard sales are allowed? Four per year, but not more than two in a 90 days period. 13. Where can I dispose of yard waste, limbs? You may take them to the City Collection Station located at 4100 Smith Road. 14. Can I put my vehicle for sale in a parking lot? No, most business parking lots are not zoned for sale of vehicles. 15. What are Midland's current water restrictions? 1. Who do I call if I want to do a Ride Along with an officer? 1. What is the current local and state sales tax rate? 1. How do I obtain a fire or accident report? To obtain a fire or EMS record, please call 432-685-7495 during business hours from 8 a.m. to 5 p.m. Monday through Friday. To obtain a motor vehicle accident report, please call the Midland Police Department at 432-685-7108. 2. How do I schedule a Fire Station visit? To schedule a group visit to your local fire station, please call 432-685-7332. Families and small groups may visit Central Fire Station without an appointment during business hours outside of 11 a.m. to 1:30 p.m.
3. Is there currently a burn ban in Midland County? Burn bans restrict all outside burning to prevent the spread of wildfire. 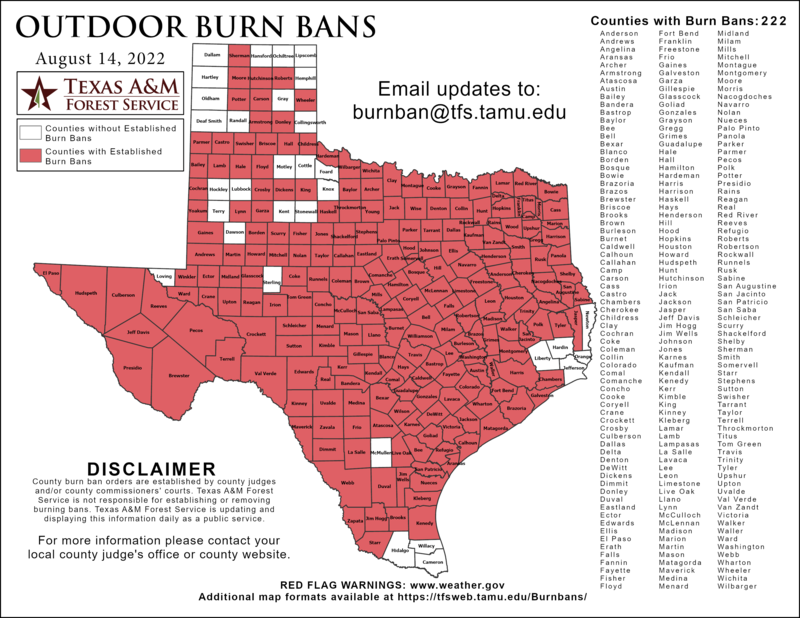 The Texas Forest Service maintains a list of all current burn bans in Texas. 4. Does Midland Fire Department provide car seat training? Car seat training is currently provided by the Midland Police Department. To schedule a car seat training with a certified specialist, call 432-685-7105. 5. How do I become a firefighter with the Midland Fire Department? Firefighter hopefuls may apply for the Fire Recruit position when it is visible on the City of Midland’s job opportunities page at www.midlandtexas.gov/jobs. Recruits are required to attend assigned training and become certified firefighters with the Texas Commission Fire Protection and certified by the Texas Department of State Health Services as an EMT within one year of employment. ·Out-of-state fire certification with IFSAC seals. Midland College runs a firefighter academy annually as well as EMT and Paramedic programs. For more information, please contact Mark Kuhn at 432-685-6757 or visit www.midland.edu. For more information regarding applications, please call 432-685-7346. 6. Will the Midland Fire Department provide water for pools or tanks? No, the Midland Fire Department will not provide water for pools or tanks. 1. What version of the International Fire Code has the City of Midland adopted? The City of Midland adopted the 2015 version of the International Fire Code in November 2015. 2. Can work on my construction project begin before the plan review process is complete? The plan review process must be complete and a set of accepted and stamped plans must be on site before work may begin. 3. Can I use a BBQ grill on my porch or balcony? The International Fire Code requires 10 feet of clearance between open flame cooking appliances and combustible surfaces or structures in non-sprinklered multi-family occupancies. Most apartment patios and balconies do not permit the required clearance. Management may prohibit any open flame appliances as part of your lease agreement. 4. How do I maintain a smoke detector? 5. How do I set up a fire protection system inspection? Once stamped plans have been returned to the contractor, the fire inspector’s name and phone number will be listed on the plan's cover sheet. All fire protection systems shall be pretested before an inspection is scheduled. 6. What are the rules for fireworks in Midland? Possession and discharge of fireworks within the city limits or within 5,000 feet of the city limits is prohibited by law. Any firework that must be ignited by a heat source is illegal to possess or discharge. Small items such as "poppers" are not prohibited. Individuals are subject to confiscation of all fireworks found in their possession and a fine up to $2,000 plus court costs. Fireworks also may not be discharged on federal, state, or county roadways. If individuals plan to discharge fireworks on private property not belonging to them, they must have a written letter of permission from the land owner. The Midland Fire Department also reminds citizens to use caution when discharging fireworks. Eye and burn injuries are common among children, and they should be supervised by an adult. Devices such as sparklers may reach temperatures exceeding 1,000 degrees. Grass fires are another potential risk during fireworks season. Have at least one of the following extinguishing agents available while discharging fireworks: water, sand or dirt, or a portable fire extinguisher. Never hesitate to call 911 if a fire develops. 7. Can a day-of fire protection system test be scheduled? Normally, a minimum of 72 hours is required to scheduled an appointment to witness a system test. If a fire code official is available, the time frame may be shorter. Please call 432-685-7333 to schedule an appointment. 8. Can a building be occupied before the fire protection systems are tested and approved? In buildings where an automatic sprinkler system or fire alarm is required by code, it shall be unlawful to occupy any portion of a building or structure until the automatic sprinkler system and fire alarm system have been tested and approved. 9. Can stock or merchandise be placed in a building before the fire protection system are tested and approved? A partial permit of stock and merchandise may be issued on the agreement of both the fire code official and the building code official only after all fire protection systems have been tested and approved. 10. When is a Knox Box (key box) entry required on a property for emergency access? A Knox Box shall be placed on all occupancies with a fire alarm system or fire sprinkler system that initiates an automatic fire department response. A Knox Box may be ordered directly from the Knox Corporations at knoxbox.com. 11. Can a contractor go vertical with a building before the fire lane is installed or before the fire hydrants have been tested and approved? In order to go vertical with construction of a building requiring fire lanes, the fire lane must be installed and fire hydrants must be tested and approved. 12. Does the Midland Fire Department charge fees for plan submittals? The Midland Fire Marshal's Office does not maintain a fee schedule or require any fees for Fire Alarm Systems, Fire Sprinkler Systems and/or any plans submitted for review by the Midland Fire Department Fire Marshal Office. For questions about code enforcement, building codes, construction permits and fees/fee schedules for other departments within the City of Midland, please contact City of Midland's Code Division at 432-685-7391. 1. Can I get a copy of my birth certificate at Municipal Court? An appearance is required to be made within 14 calendar days from the date your citation was issued. Your appearance should be made in person or by mail. You cannot enter an appearance by phone. 3. Can I get an extension to appear over the phone? No. Your request must be made in person or by mail. 4. Can I enter my plea by phone? No. You must enter your plea in person or by mail. If you enter your plea by mail, be sure that you enter your plea to each charge individually. 5. I am 16 years old or younger, do I have to appear before the Judge? Yes. Texas State Law requires persons who are 16 years of age or younger to appear in open court before a judge with a parent or legal guardian. 6. I am under the age of 21 and have been charged with an alcohol related offense. Do I have to appear before a Judge? Yes. Texas State Law requires that you appear before a judge in open court. If you are under the age of 18, you must appear with a parent or legal guardian. 7. I am under the age of 18 and have been charged with a tobacco related offense. Do I have to appear before a Judge? Yes. Texas State Law requires that you appear before a judge in open court. You must appear with a parent or legal guardian. 8. How can I speak to a Judge? You must appear during an arraignment session. No appointment is necessary. You should check in at least 15 minutes early at the cashier window. Be prepared to present your ID. No shorts are allowed in the courtroom. 9. Is the Municipal Court closed during the lunch hour? No. Clerks are available to assist you during business hours. 10. Am I required to have an attorney represent me? No. You may have an attorney represent you if you desire, but this is not required. Most defendants in Municipal Court do not use attorneys. 11. Will the Municipal Court appoint an attorney for me? No. If you would like to consult with attorney, it will be your responsibility to do so. 12. Can my spouse, relative or employer take care of my ticket for me? No. Texas State Law requires that you enter a plea on your own behalf. 13. What is the difference between a plea of "no contest" and "guilty"? For the Municipal Court, a criminal court, there is really no difference. A plea of "no contest" cannot be used against you in a civil court. 14. What happens if I contest a charge? You will be set for trial. You have the right to have a jury trial by six persons of this community. You may waive this option and have the case heard by a Municipal Judge. A judge or jury will determine the verdict of each case set for trial based on the merits of each individual case. If you do not wish to have a trial, you will need to enter a plea of "no contest" or "guilty". 15. What is the standard fine amount assessed? Cases heard in Municipal Court are Class C misdemeanors. In most cases the fine cannot exceed $500 plus court costs. However, in some cases the fine can be as much as $2,000. You may pay your fine with cash, a cashier's check or money order. You may also pay your fine with a personal check, debit card or credit card as long as it reflects your name. If you are under the age of 18, we will accept a check, debit card or credit card from your parent. The parent must be available to sign the check or debit/credit card slip. If you are on warrant, you must pay with cash or money order. 17. Can I make a payment over the phone? No. You may make your payment at the cashier window during business hours. You may also mail your payment. A Night deposit is available 24 hours and is located at the back door of the Municipal Court building. Some citations may be paid online. 18. Can I make a request to pay late by phone? No. Requests to pay late must be made in person or mail. 19. Can I attend the alcohol awareness course online? There are no providers in the area that offer online courses. 20. Can I get a copy of my marriage license at Municipal Court? 21. How can I get an occupational license? 22. I received a ticket from a State Trooper or Sheriff's Deputy in Midland County. Can I take care of the ticket at Municipal Court? 23. Can I get a copy of my divorce decree at Municipal Court? 1. What is the closest a well can be permitted to a house under Ordinance 8769? The Ordinance allows up to 500 feet before a variance would be required and needing the approval of the City Council. 2. What is the job of the Oil & Gas Advisory Committee? The role of the committee is to review Oil & Gas applications for (1) technical compliance and (2) administrative completeness. 3. Who approves the Oil & Gas Applications for a permit? The City Council approves or denies Oil & Gas Applications. Applications are brought to City Council meeting for public hearing and after thirty days (30) City Council may vote at a regular meeting. 4. What are the allowed working hours of the drilling rig? Drilling is allowed twenty-four (24) hours without time constraints. 5. What about wells being drilled in the county? The Ordinance 8769 has jurisdiction only for those permitted wells located in the city limits. 1. What are the fees to enter the City of Midland pools? 2. Who do I contact for Park reservations? 1. Who is eligible for a protective order? A person who has a divorce pending is eligible for a protective order. The protective order must be filed in the court in which the divorce is pending. You may also be able to get a protective order against someone who has sexually assaulted you even if they are not a family or household member (like a co-worker or neighbor). 2. What does it cost to get a protective order? Nothing, a protective order is free. You cannot be charged a fee for filing, serving, or entering a protective order. The court may order that your abuser pay any attorney fees (if applicable), and all other fees, charges, or expenses incurred in connection with the protective order. 3. What types of protective orders are available? 4. What is a Magistrate’s Order of Emergency Protection? How long does it last? A Magistrate's Order of Emergency Protection (what most people call an Emergency Protective Order). These are called different things in different parts of the state. They are good for 31-61 days. If you partner has been arrested for a family violence assault, you must ask for this before he is released from jail. 5. What is a Temporary Ex Parte Order? How long does it last? A Temporary Ex Parte Order is a court order designed to provide you and your family members with immediate protection from your abuser. In order to get a Permanent Protective Order, you need to have a full court hearing with your abuser present. A Temporary Ex Parte Order will protect you from the time you file for the Permanent Protective Order until your full court hearing. You may receive a Temporary Ex Parte Order without your abuser present. The court can issue a Temporary Ex Parte Order if it decides that the information given in your application for a protective order presents a clear and present danger of family violence to either you or a family member. 6. What is a Permanent (or Final) Protective Order? How long does it last? A Permanent (or Final) Protective Order is a court order that is designed to stop violent and harassing behavior and to protect you and your family from the abuser. A Permanent Protective Order is effective for the time period specified in the order up to a maximum of 2 years. If there is no time period specified in the order, then it expires on the second anniversary of the date the order was issued. If the Respondent is still incarcerated on the date that the protective order is set to expire, then the expiration date is extended for one year from his date of release. 1. Does Midland PD accept lateral transfers? We accept TCLEOSE certified officers, however all officers start at the bottom of the seniority list. 2. If I get disqualified during the hiring process, when can I re-apply? You are eligible to re-apply 1 year after the date of the applicant testing was completed unless told otherwise by the recruiting division. 3. Is there a policy on tattoos? Yes. Officers can have tattoos. All tattoos must be covered while in uniform. 4. Can I do a ride along with an officer if I am in the hiring process? Yes. The Ride Out program is designed to give interested applicants a firsthand view of what police work is like in Midland, Texas. We recommend riding out on Friday or Saturday nights with an evening shift officer (3 p.m.-3 a.m.) or night shift officer (6 p.m.-6 a.m., 7 p.m.-7 a.m.). The ride along must be scheduled by contacting the recruiting division with at least a week notice. 5. Are there civilian positions available at the Midland Police Department? 1. Where can I watch CityTV? CityTV is available to the public on channel 2 for Suddenlink customers and channel 6 for Grande customers. Our shows are also available on our YouTube channel. Our Public Information Act Coordinator, Tammi Casey, fills all open records requests. You can visit the City's Public Information page or learn more about open records laws on the Attorney General's website. Submit a letter which contains the date of the damage, the location where the damage occurred, a description of the damage, what you are requesting from the City, and the property owner's name, phone number, and address. Include with your letter at least two estimates for repair or replacement of the damaged property and pictures of the damaged property. You may submit your claim to Risk Management by mail, email, or fax, or complete it	online. 2. Does the City handle claims for work injuries for non-City employees? No. Risk Management handles only cases involving City employees. Other claims should be addressed to your own employer. 3. Do I need to file a claim in person? No. You may notify Risk Management of your property damage by phone, mail, or email. You may submit your necessary documentation by mail, email, or fax, or complete your claim online. Once Risk Management receives all the necessary information and documentation, a decision should be reached within four weeks. 5. What should the public do if they observe an unsafe condition? Members of the public who observe an unsafe condition relating to operations of the City of Midland should note the details of the condition (i.e. description of condition, location, vehicle number, time of observation) and contact the Risk Management Division. 1. How do I report a street- or drainage-related emergency? To report an emergency situation within our street system, right of way, or drainage channels, please call 432-685-7293 during regular business office hours or 432-685-7340 for 24-hour service. 2. How do I report missing Traffic Signs or Traffic Signal malfunctions? To report missing signs or traffic signal malfunctions, call 432-685-7293 during regular office hours or 432-685-7110 for 24-hour emergency response. 4. How do I report sight triangle or visibility obstructions? To report sight obstructions, call 432-685-7287 during regular office hours or 432-685-7110 for emergency response. 1. What is the cost for testing? The cost for testing Total Coliform & E. coli in drinking water is $18 per sample. Testing on non-potable water is $25 per sample. 2. What is Total Coliform? Total Coliform is an indicator bacterium. When present, it indicates that the water tested may be contaminated with disease causing bacteria. Positive results will also be tested for E. coli, a specific coliform which is harmful when ingested by humans. 3. How do I get started on receiving testing? Stop by the lab during normal business hours and pick up sampling handouts, Chain of Custody forms and sample bottles. 4. What requirements are associated with sampling? All samples must be turned in within 15 minutes of sampling OR within 30 hours of sampling on ice. Don't forget to only sample in a City of Midland sample bottle and	fill out the Chain of Custody form completely. You may have low water pressure due to a cut off at meter not being completely open, a faulty water meter, a possible crimp in the service line, a water main leak in your area, isolated water valves on main water supply lines (not open), or restricted water supply through your water softener due to a clog. Please call 432-685-7270 to report low water pressure in your area. 2. What do plumbers mean when they reference the "city side" of the sewer line? When plumbers reference the "city side" of a sewer line, it is actually called a sewer tap. It extends from the resident/business property line to the point at which it makes contact with the main sewer supply line in alley/street. The sewer line from your property line to your house is your private service line. 3. I have water coming out of my meter box. What should I do? Water coming out of a meter box could be a sign of a possible leak. Please contact Customer Service/Billing at 432-685-7320 to report the issue. 4. Why do I have discolored water coming from my faucet? You may have discolored water coming from your faucet due to excessive iron or manganese coming from the main water supply line, possible water main repairs in your area, or possible water valve maintenance in your area. Please contact Water & Wastewater at 432-685-7270 to report the issue if you notice discolored water coming out of your faucet. 1. Why does Midland have water restrictions? Midland is currently contracted to use surface water sources owned by the Colorado River Municipal Water District. These sources are depleting due to the drought and evaporation. The addition of groundwater from T-Bar and Clearwater Ranches has secured many decades of more water for Midlanders, but the drought necessitates that we be good stewards of these sources. 2. Where does Midland get its water? The City of Midland’s primary water source is the Colorado River Municipal Water District (CRMWD). This consists of Lakes Thomas, Spence, and Ivie. The Paul Davis Well Field is another water source, and T-Bar and Clearwater Ranches will most likely become the city's primary water sources in the future. 3. What are Midland's current water restrictions? 4. How can I request a variance from current water restrictions? Anyone who would like to request a valid variance from the water restriction schedule may do so by filling out the Variance Petition Form online. 5. Can I use sprinkler system, soaker hose, drip system, hand held hose, etc.? Any method of watering is allowed during your established watering time. 1. What is the hardness of Midland's water in grains per gallon? The City’s water hardness ranges from 400-600 parts per million, which can simply be calculated by dividing that by 17.12 which will give you the grains per gallon. 2. My bathroom smells like rotten eggs after I run water from the faucet. What's the cause? The smell of rotten eggs does not come from water, but rather from the sink's drain. The smell can be neutralized by pouring bleach down the drain and letting it sit overnight. Vinegar and baking soda works as a substitute for bleach. 3. Where can I find information on the City of Midland’s water quality? Reports and notices about water quality provided by the City of Midland can be found at http://www.midlandtexas.gov/167/Reports-and-Notices. The TCEQ also maintains a Drinking Water Watch website with information about the City of Midland's system at http://dww2.tceq.texas.gov/DWW/. Midland's information can be found by entering "1650001" into the field labeled "Water System No." 4. What is the City’s average chlorine residual in the distribution system? The TCEQ requires a chlorine residual within the operating range of .5-4.0 ppm for Midland's water distribution system.